A Guide to International Investing: Unstable Government? Buy it. Happy Businesses? Short it. When a government fails – whether due to warfare, failure to provide services, or insolvency and cutbacks - the citizens of the country go through several psychological stages. Unfortunately I’ve witnessed these stages, and gone through them myself. I used to enjoy off-the-beaten path travel and journeyed to places in transition such as post-Soviet Central Asia in 1992 and Central Africa in 1996 (inspiration for the Heart of Darkness quote above and throughout today’s letter). The particulars of my experiences are too lengthy and surreal to write about here, but suffice it to say, when the lights go off, the bugs come out. When a government first falls – when the President flees the country or a brand new group enters power – there is at first hope that business will continue as usual. This represents the stage of denial. In the second stage, as laws change or law and order break down entirely, citizens enter a stage of paralysis. I saw this in the post office in Kisangani, Zaire, where well-dressed postal workers came to work every day despite not having been paid in 2 years and having no work to do. Paralyzed citizens protect valuable possessions and listen to every rumor for signs of danger. Their indecision is broken when they realize that inaction will cost them dearly, often leading to the third stage: disorganized panic and escape. They run away or, if they don’t have the resources to run, they bunker down. In the fourth stage, they become accustomed to the new order, either learning to live as a refugee or accepting the new authorities and laws (or the arbitrariness of the laws). In Africa in 1996 I traveled from Uganda to Cameroon overland. In Zaire (now Congo) the government was absent – warlords and bandits were dividing the country. And when I was in the Central African Republic, a rebel army was camped outside the capital, regrouping for a second assault. Adventurous diamond and gold traders remained in Zaire, despite the danger, buying up gold nuggets and uncut diamonds at bargain-basement prices from local miners. Nothing good came from those African failed states, which remain troubled today, but those hardy entrepreneurs profited handsomely – if they survived. "I couldn't help asking him [Kurtz] once what he meant by coming here at all. 'To make money, of course. What do you think?' he said scornfully." In 1992 after the U.S.S.R. collapsed, prices collapsed with it. To my surprise and delight, in post-Soviet Central Asia I found I could eat as many delicious local dishes as I wanted and never spend more than $0.10 on food per day. I saw large hand-woven wool carpets in department stores priced at $50. And I was offered a smorgasbord of military hardware at tremendous discounts (a MIG fighter jet for $10,000, anyone? How about RPGs for $100 each?). When Communism fell, goods became exceptionally cheap. And this mispricing is how most Russian oligarchs made their fortunes, buying commodities at unadjusted Soviet prices and exporting them to Europe for global market prices. In both Africa and Central Asia I observed that government instability drove out nervous investors. The crazy and courageous who stayed behind, if they survived, profited tremendously. Given these personal experiences, it was incredibly exciting this week when our phenomenal new data scientist, Changjie Liu, discovered the powerful predictive nature of government instability, and other sentiments, in our Country-level sentiment data. Greater government instability reported in the media signals an excellent opportunity for intrepid investors. Today’s newsletter looks at the power of national emotions and news headlines in predicting a country’s stock index return. For some background – if you follow us regularly you know that at MarketPsych we perform semantic analysis on 2 million articles daily from social and news media. We have archives of such articles back to 1980 (1998 for the Thomson Reuters MarketPsych Indices). 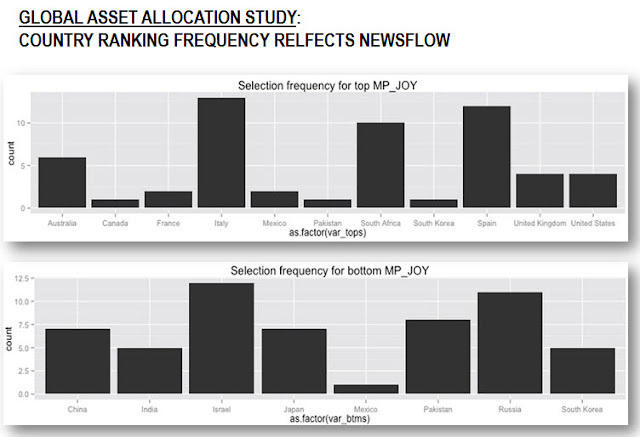 Our software scans the content of each article in the news and social media flow and quantifies sentiments expressed about specific companies and locations. Beyond sentiment, we also look for complex concepts such as GovernmentInstability and macroeconomic themes such as MonetaryPolicyLooseVsTight (a measure of easy versus tight monetary policy discussed in news and social media). 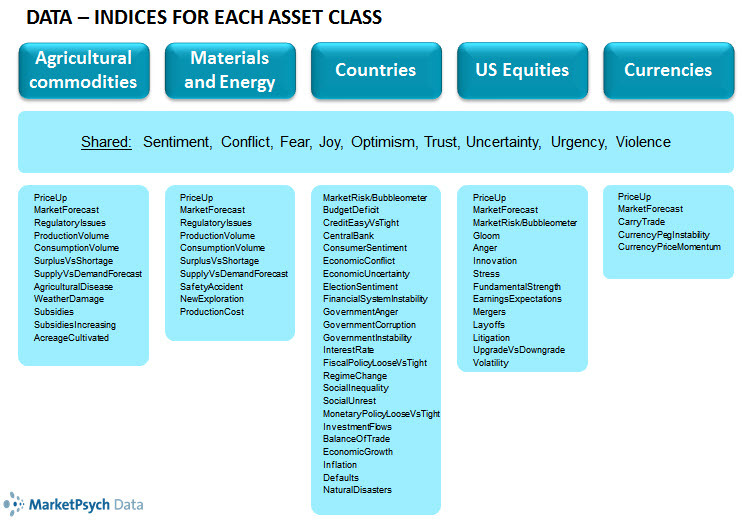 Several of the sentiments and themes we track appear predictive of future stock market movement globally. Extracting emotion about different countries and locations from the business news is very difficult, especially when dealing with a firehose of unstructured information. For example, we take special measures to exclude travel, entertainment, sports and other business-irrelevant sentiments. Because all of the language we analyze is English, we are often quantifying an English-language cultural perspective on non-English-speaking countries. In today’s newsletter I describe a series of studies we performed on our country sentiment data. The descriptions are informal, as the research is still underway. We are preparing a more formal research paper to describe the findings in detail with methodology. For a given year, we ranked sentiment in each country for the year and went long the top 4 and short the bottom 4 for the ranked sentiment (Joy is inverted below). Several sentiments stood out, in particular Joy, Fear, Government Instability, and MonetaryPolicyLooseVsTight. For the sake of brevity I will focus on those in the remainder of this newsletter. The below chart on the left indicates a 3-fold return from 1999 to June 2012 using a strategy that shorts the stock indexes of the 4 countries with the highest Joy and buys the 4 with the lowest Joy. We see 10-fold returns if one buys the highest government instability and shorts those with the lowest government instability. Lesson to international investors so far? Buy national unhappiness (low Joy) and GovernmentInstability, short Joy and government stability. Note that our FinancialSystemInstability variable did not correlate strongly with returns, but our GovernmentAnger, RegimeChange, and ElectionSentiment (inverted) variables had correlations similar to GovernmentInstability. There was also a concern that perhaps the same countries were appearing on GovernmentInstability (e.g., Pakistan), and thus biasing the sample. In fact, there were almost no countries remaining at the extremes of one of the ranking list over the entire 14 year period. 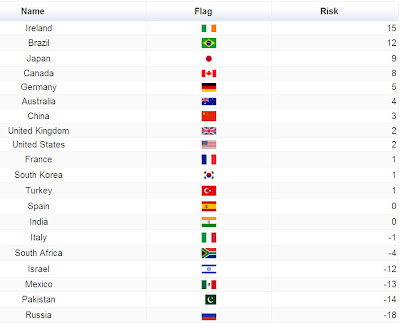 For Joy we see Italy and Spain dominating the high list, but for low, we don’t see as much consistency overall. Generally speaking, several countries and regions go into and out of the rotation for both the top and bottom groups, which supports sentiment as an independent region and country-selection tool. We then examined stability of returns for the group of Countries with the largest Buzz over the past year, and we found better returns. Buzz – a proxy for investor attention – appear to itself be a useful variable for improving country selection. When we divided the group of countries into Developed vs Developing groups of nations, we continued to see return consistency. Also we see consistency for a group of European countries only. In fact, Joy led to much higher returns in Europe only. The below chart depicts Joy arbitrage in the top 8 highest Buzz European countries, shorting the 2 with highest Joy and buying the 2 with lowest Joy. We also looked at past stock index return. There is a powerful mean-reversion effect of past one-year country returns, and arbitraging past return would earn a 5-fold return over our study period. 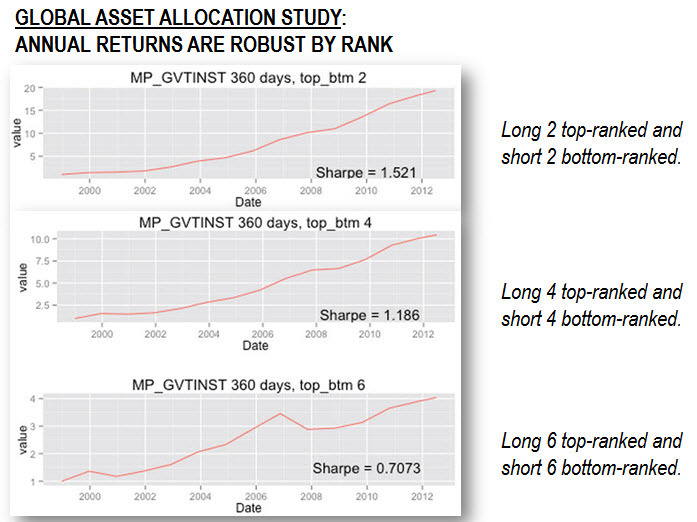 Fortunately, we found that this effect is independent (for most TRMI) from our sentiment strategies. There is an interesting philosophical issue with Monetary Policy. 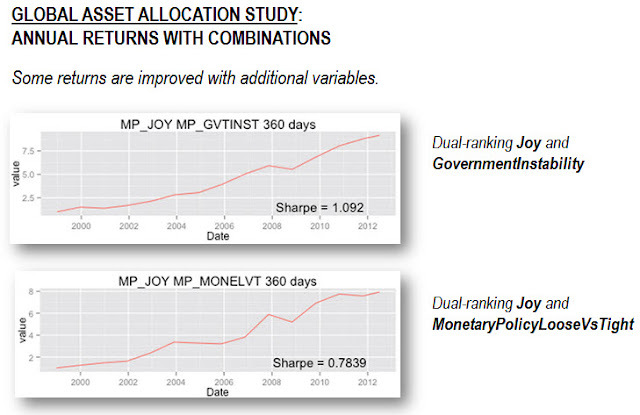 We see that a combination of high Joy and easy Monetary policy leads to greater underperformance. Perhaps Joy is a proxy for overconfidence that leads to profligate spending and excessively low interest rates. I hate to be the wet blanket, but national economic Joy may be good for politicians, but ultimately backfires for investors. In case you’re interested in playing with or implementing such strategies for yourself, please get in touch with Thomson Reuters (or me) to check out a trial of our data. Below are two depictions of 2012 sentiment generated by our Chief Data Scientist, Aleksander Fafula. The first map represents Joy extracted from social media. Darker countries have higher variable values. I’m not sure what is happening in Morocco, but it must be really good. White countries have no data available in the TRMI. "[Kurtz] declared he would shoot me unless I gave him the ivory and then cleared out of the country, because he could do so, and had a fancy for it, and there was nothing on earth to prevent him killing whom he jolly well pleased." During my travels in Zaire, besides learning the basics of how to grade raw diamonds and out-bluff gunmen, I learned that intrepid investors find the best opportunities in places where authority is fragile or non-existent and darkness (low Joy) is endemic. 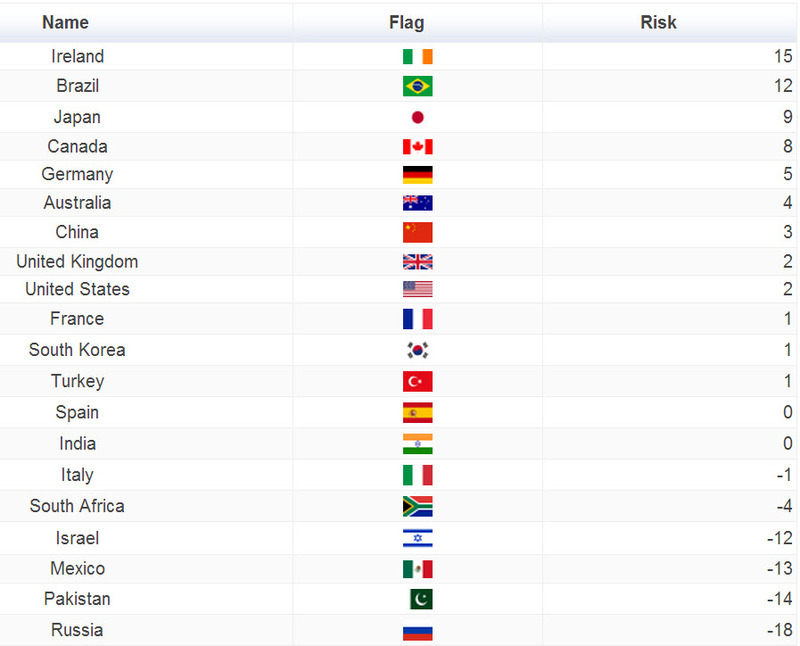 You may invest in these countries, but don’t forget your bodyguard. Of course, there are risks to investing in unstable places. But it is the human tendency to catastrophize – to exaggerate risks beyond their actual danger – that makes these risks so lucrative for enterprising investors. Is global sentiment predictably driving investment flows around the world? We believe our data confirms this – English-language news loaded with frightening topics (like government instability) is driving investment flows away from areas where investment would be best allocated. We have a number of Spring 2013 speaking engagements in New York, London, Toronto, San Francisco and Boston – we look forward to seeing our friends in those cities!